Alaska Yukon Moose are the largest of all of the moose and they are the largest of the moose sub species in the world. They can reach a height of 7 feet at the shoulder and can weigh in excess of 1500 pounds. They are abundant in our area and throughout the Yukon with a population that is stable or increasing. 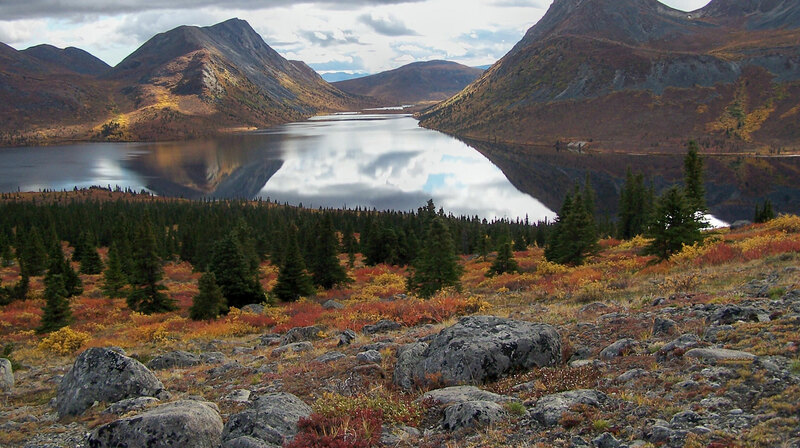 Moose habitat can range from valley bottoms, rivers, lakes and swamps to high alpine willow draws. Traditionally the bulls seem to become active and peel the velvet off their antlers by September 1st. They start to do some travelling and may be seen in pre-rut groups consisting of several bulls. As the season progresses the timing of the rut and the bulls activity seems to vary depending on weather, circumstances and the individual animals. Some bulls are quick to find a girlfriend or several girlfriends, stay put, and focus on breeding and keeping the other bulls away. Other bulls take a little longer or are the ones that are travelling, actively looking for the girl of their dreams and challenging the other bulls right to remain with their harem. Mature bulls in our area consistently have good horn palmation, good fronts or shovels and have long tines. Width can range from 55 to 70 inches. 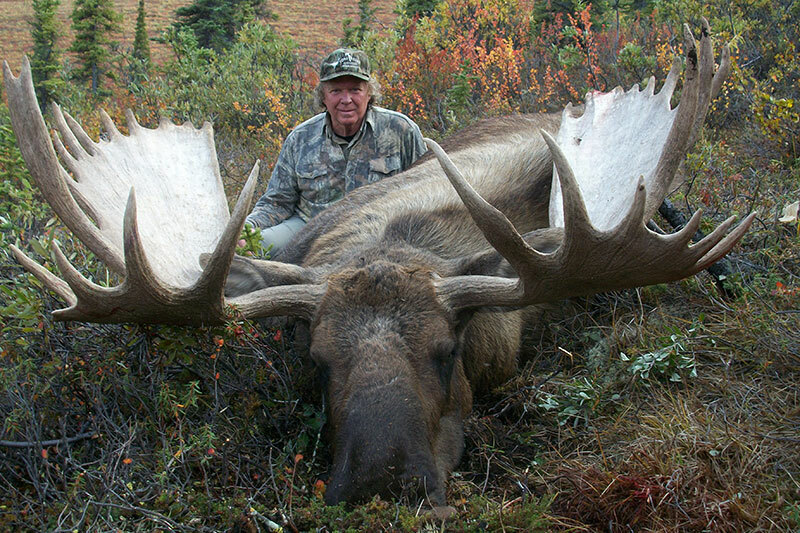 We consistently harvest bulls between 55 and 65 inches with Boone and Crockett scores between 200 and 215. 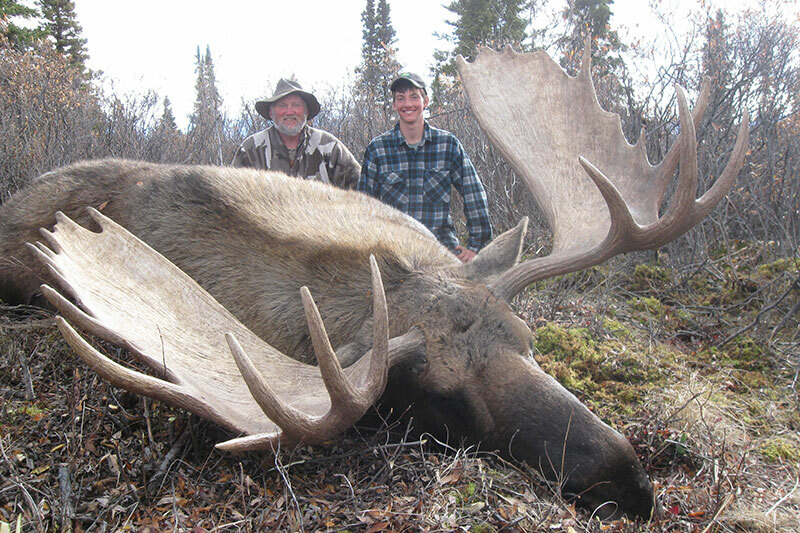 We have harvested record book moose and depending on the year our average moose varies between 57 and 63 inches wide. 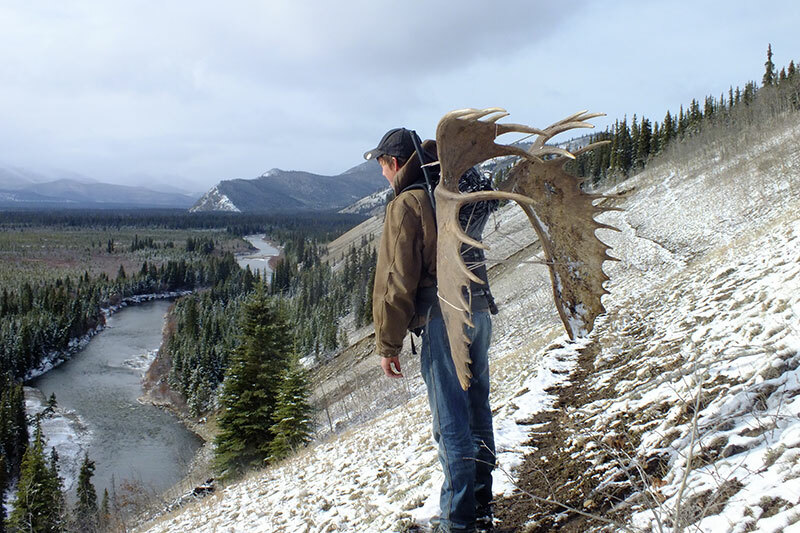 While hunting moose it is important to remember that width is only one indication of the size of the moose and it is important to look at the other aspects of the antlers such as palmation and tines. 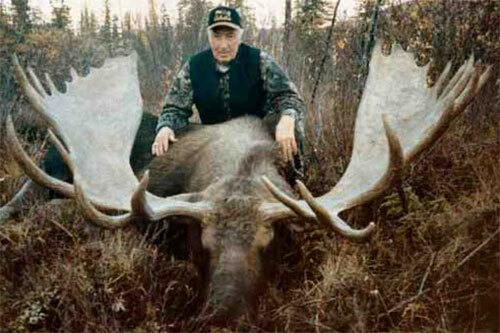 Sometimes a slightly narrower moose with good palmation and tines will outscore a wide moose. Our hunts are horseback hunts and involve “glassing”, “spot and stalk” andoften some calling. The hunter is often based from a cabin but dependingon what the guide thinks is the best opportunity the hunter may spike out with the horses and tents. The horses permit you to be mobile and cover more country while you are hunting however the real benefit of a horse hunt can be easily noticed with travelling through the low “buck brush” as well as the ability to spot moose from a distance and then arrive in that location relatively quickly. Of course once a hunter harvests a moose the ability to access it with horses to pack the meat and trophy back to camp is unparalleled and certainly makes the entire trip more pleasurable. Having a guide as well as a wrangler on your hunt, good accommodation, access to a great bunch of horses, being in some awesome country with a healthy moose population all contribute to a fantastic hunt with great success on high quality animals.